vSphere 5.0 has many new compelling features and enhancements. Sometimes though it is that little tiny enhancement that makes life easier. In this case I am talking about a tiny enhancements for vMotion which I know many of you will appreciate. It is something that both Frank Denneman and I have addressed multiple times with our engineers and finally made it into this release. I guess we have all cursed when we had to manually migrate VMs around and accidentally selected the wrong Resource Pool. This operational “problem” has finally been resolved and I am very happy about it. As of 5.0 the “source” resource pool will automatically be selected. Of course it is still possible to override this and to select a different resource pool but in most cases “next – next – finish” will be just fine. Bravo! This has been an annoyance of mine for many years. Good to see VMware not overlooking “the little things”. Yay, I can’t tell you how many times this has caused me frustration. 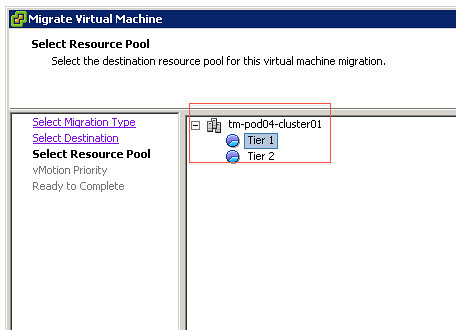 Will it retain each VM’s source resource pool when moving multiple VMs that are in different pools to begin with? I was so frustrated with the old behavior. What does it do when selecting a number of machines from different Resource Pools? That was the most anonying as you had to move all the machines to the same resource pool. Do anyone know FT CPU restriction up lifted from 1 vCPU in vSphere 5? Do you know if they reverted the drag&drop behavior? I remember using VirtualCenter 2.5. If I initiated a VMotion with drag&drop, it didn’t ask about the resource pool, it just used the current one. However, it would ask for the resource pool if you selected ‘Migrate’. When I upgraded to vCenter 4, that changed and you had to select the resource pool even with the drag & drop, which has caused an annoyance to me ever since. Good news indeed! I’ve always wondered why the heck anyone would want to change resource pool at the same time as a vMotion, and the old requirement to dig up the resource pool has certainly wasted a LOT of vSphere admins’ time. I mean, the whole concept of DRS is to abstract the individual hosts’ resources into a pool of common resources, so why make such a big deal out of a simple VM migration? DRS does it all the time.